Whispers in the Loggia: "Love" Coming Soon... in "Truth"? 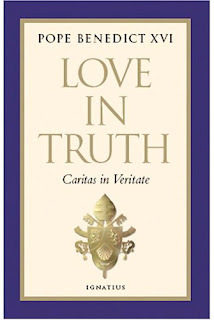 If his pre-papal publisher is to be believed (both on Amazon and its own page), B16's third encyclical -- the long-anticipated Caritas in Veritate ("Love in Truth") on social concerns -- will publish on 30 September. Framed from its first buzz as a modern-day take on Paul VI's Populorum Progressio, the Ratzinger text was first expected in time to mark the 40th anniversary of Papa Montini's March 1967 manifesto on global development. Its last rumored drop-date -- Europe's traditional "Worker's Day" of 1 May -- came and went, as did another earlier target of St Joseph's Day, 19 March. 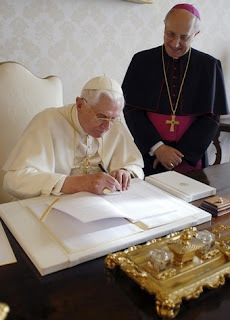 As summer neared, word leaked that the pontiff had set up a small working group to aid him in the text's preparation, tapping a mix of prelates and experts including the Vatican social-justice czar Cardinal Renato Martino, Benedict's successor as archbishop of Munich Reinhard Marx and Stefano Zamagni, an Oxford-trained Italian economist. At the same time, the Secretary of State Cardinal Tarcisio Bertone announced that the text wouldn't be ready until the Fall... and, well, here we are. Yet adding together that Rome's just starting to come back to life from vacation season, the time needed to prepare a final text -- and the repeated wars that've broken out over the Vatican's official translation of this pontificate's major texts -- it's pretty safe to view a September 30th pub-target as overly optimstic; while the Italians are saying October, an encyclical whose timing could be viewed as a papal "voter's guide" to the Stateside fold would likely be one October surprise too many for some ad extra on these shores (not to mention overshadowing October's monthlong Synod on the Word). Ergo, smart money seems to say we'll end up seeing the finished product closer to late November's first anniversary of Spe Salvi -- but given the wait for this one, anything's possible.